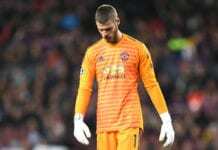 Paris Saint-Germain goalkeeper Gianluigi Buffon is bracing up for his team’s Champions League clash against a resurgent Manchester United team. The two teams will try to secure an advantage in the first leg of their last 16 clash on Tuesday night before the return leg in Paris on 6 March. United head into the clash having gone 11 games unbeaten under Ole Gunnar Solskjaer since becoming the interim manager in December. And Buffon feels that the turnaround in fortunes for the Red Devils will make the match a lot difficult, with PSG losing their first league defeat of the season against Lyon. “Old Trafford is the temple of a great team with a very important history,” he told FourFourTwo via Sky Italia. “This tie must be confronted in a serious way and without any regrets. We’ll regret it if our way of playing isn’t expressed in the way that the match demands. “Football is strange: two months ago, at the time of the draw, everyone thought that PSG would go through. “Two months later, seeing what has happened with us and the developments at Manchester United, we are at the least on the same level now. Buffon equally had some words for former Juventus teammate Paul Pogba who would be in action tomorrow. “Paul is a golden boy, I’m always pleased to see him because he’s an incredible champion,” Buffon said.